Congestion and inflammation in the ascending/hepatic and splenic flexures/descending colon. Lymphatic congestion and toxicity throughout the body. Besides the known breast scans, thermal imaging can detect hypo/hyper thyroidism, fibromyalgia, autoimmune, stroke risk, cardiovascular health, dental, kidney, intestinal disorders, pre-diabetic or diabetes and much more. Most, if not all of these conditions start with inflammation and changes in your microcirculation brought on by hormone changes, immune health, lymphatic congestion, toxicity, pain, angiogenesis, which are virtually impossible to detect with X-ray technology. 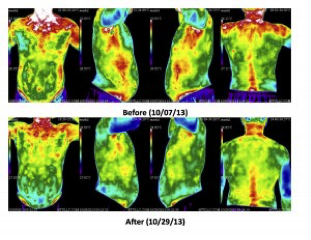 Thermography can see inflammation! Humans are infrared beings. Thermography views what is not seen by the naked eye. It senses heat and cold. Where there are significant temperature variations in the body, there is activity. Where there is activity, there is information for us to evaluate. By measuring changes as small as 1/100th of a degree in the body’s radiant heat, we see “bio-markers” or risk indicators. Published medical research confirms that these indicators reveal telltale signs of tumors, toxins and disease months or years earlier than traditional imaging procedures.